The paper presents findings of a study that assessed the drought coping and risk mitigation strategies of Masai households in Kenya. Drought occurrence was shown to increase poverty in the affected households. The impact of livestock herds erodes the basis of pastoral livelihoods and amplifies other challenges affecting pastoral households. Payments for ecosystem services (undertaken through a conservancy model of natural resource management) helped to buffer households during times of hardship. Overall the paper argued that conservancies can provide one way to deliver ecosystem-based adaptation. Figure 6. 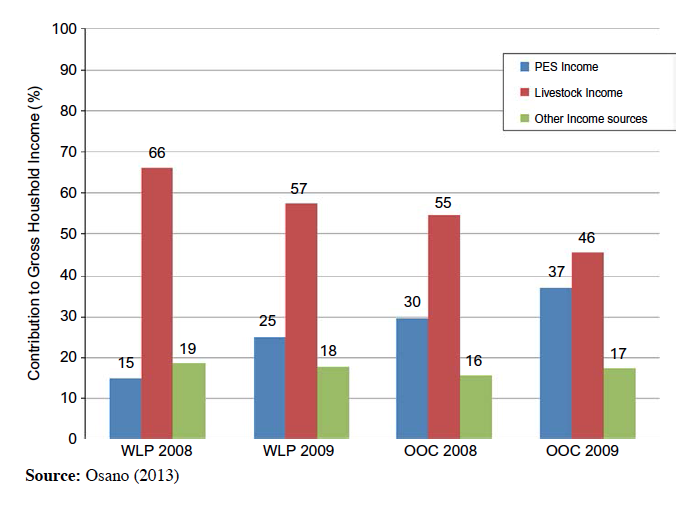 The contribution of payments for ecosystem services, livestock and other income sources to the gross household cash income in the wildlife conservation lease program (WLP) in Kitengela and the OOC in the Mara in 2008 and 2009. Purpose – The purpose of this paper is to assess the potential for pastoral communities inhabiting Kenyan Masailand to adapt to climate change using conservancies and payments for ecosystemservices. Design/methodology/approach – Multiple methods and data sources were used, comprising: a socio-economic survey of 295 households; informal interviews with pastoralists, conservancy managers, and tourism investors; focus group discussions; a stakeholder workshop. Monthly rainfall data was used to analyse drought frequency and intensity. A framework of the interactions between pastoralists’ drought coping and risk mitigation strategies and the conservancy effects was developed, and used to qualitatively assess some interactions across the three study sites. Changes in household livestock holdings and sources of cash income are calculated in relation to the 2008-09 drought. Findings – The frequency and intensity of droughts are increasing but are localised across the three study sites. The proportion of households with per capita livestock holdings below the 4.5 TLU poverty vulnerability threshold increased by 34 per cent in Kitengela and 5 per cent in the Mara site, mainly due to the drought in 2008-2009. Payment for ecosystem services was found to buffer households from fluctuating livestock income, but also generates synergies and/or trade-offs depending on land use restrictions. Originality/value – The contribution of conservancies to drought coping and risk mitigation strategies of pastoralists is analyzed as a basis for evaluating the potential for ecosystem-based adaptation.